“After years of development, Lockheed Martin completed the first flight build of its new Multi-mission Modular (MM) Solar Array. 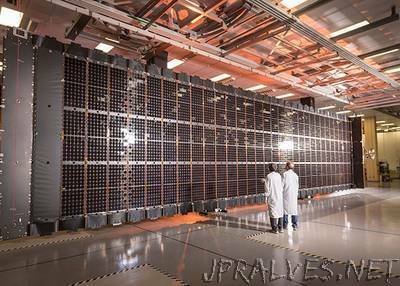 This new flexible array advances Lockheed Martin’s significant heritage flying flexible arrays on such programs as the International Space Station and a constellation for the U.S. Air Force. The new design is a major component of Lockheed Martin’s multi-year modernization of its LM 2100 satellite bus, which is part of its newly-enhanced family of buses. The MM Array incorporates three key features in the satellite design: higher power, less mass and compact stowage, and all of this enables satellite designers to better meet customers’ growing power needs. This compact flexible array design delivers 50 percent more power than previous rigid array designs at 30 percent less mass. - By swapping rigid panels for thin, flexible sheets, the upgraded design achieves reduced weight and compact stowage. Typical rigid panels range from 0.75 to 1.5 inches thick, but the MM Array’s synthetic polymer material is just 0.002 inches thick, a significant reduction. - Combined with an innovative deployment mechanism, the improvements create a design that lowers cost and allows easy configuration changes for different missions. Its first customers are for LM 2100 series of satellites, but engineers can adapt the design for other types of spacecraft.